The health care, construction, and hospitality industries lead the economy’s big job gains over the past month. The U.S. economy created 200,000 jobs in January, topping Wall Street expectations of 180,000. As always, there are industries that performed better than others in terms of employment growth. 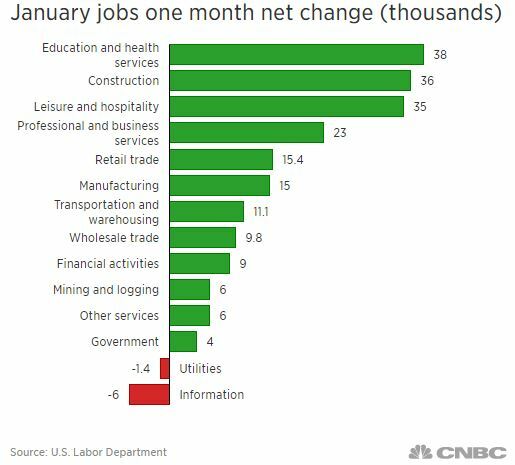 Here are the net changes by industry for the month of January, according to Bureau of Labor Statistics. The education and health services industry lead job growth in the U.S. economy over the month of January with a 38,000 gain, according to the Bureau of Labor Statistics. Health care and social assistance accounted for two-thirds of the addition, with continued growth in ambulatory services and hospital employment. Coming in at a close second, construction posted 36,000 jobs during the first month of the year thanks to strong numbers in specialty trade contracting jobs. Over the year, construction employment has increased by 226,000, the government said. The Labor Department also highlighted the food services and drinking places industry, which contributed 31,000 of 35,000 jobs in the leisure and hospitality industry. On the flip side, the information industry lost 6,000 jobs, while utilities shed 1,400, though the Bureau of Labor Statistics said that they reflected minor losses.